Medium/Large - $40.99 X-Large - $40.99 Only 3 left! Watch out the whistle has been blown. What is the call? The player is SAFE! Maybe you are shouting "Ah, ref come on clearly he wasn't." Or, "Waahoo, good call ref." But, normally you must be yelling something in response to the call. As half the crowd cheers the other half sneers. Oh, the irony and pain versus the joy and jubilation! No Matter what the ref does people always seem angry. The life of decision makers is rough no matter hockey, baseball, basketball, football, or under water polo. Is under water polo a sport? Or, no matter the league, in the NHL, MLB, NBA, NFL, or college sports refs are always given the hardest jobs. Who gets yelled at no matter what happens? The referee does! Let's celebrate refs for how awesome they truly are. Next time you see a referee give them a big bear hug! Or, maybe buy the ref a beer and dinner. Whatever the gesture they will appreciate it. Or, the best flattery is through imitation. 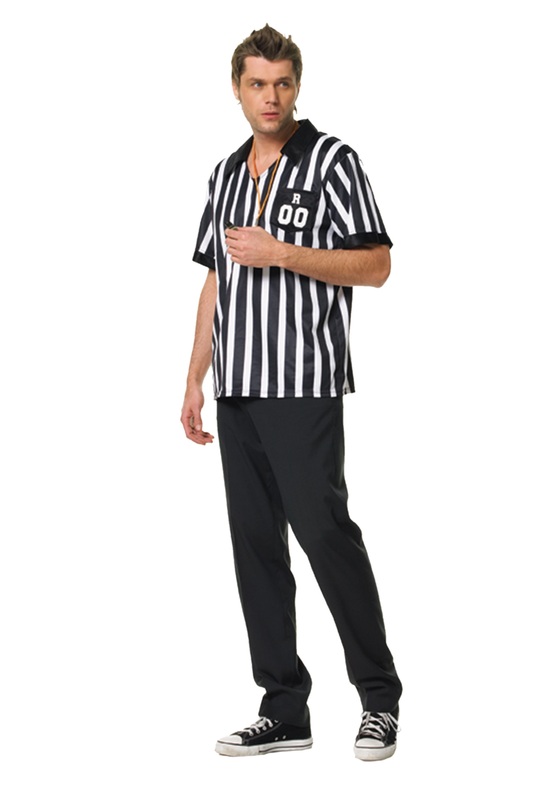 You can be just like the beloved ref in the Ref Costume. 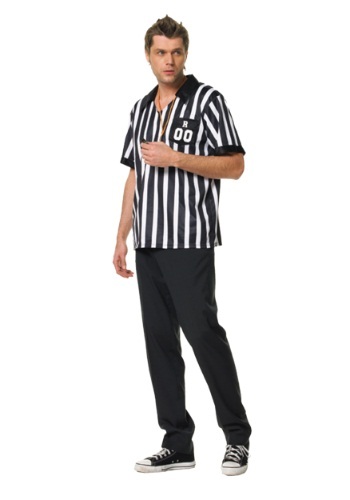 Keep things fair at parties dressed in the classic referee stripes. The front of the striped shirt has a quarter zipper and printed details on the front pocket. Just add a whistle, a rule book, and a strong voice. Before yelling "You're out!" make sure your whistle is handy!